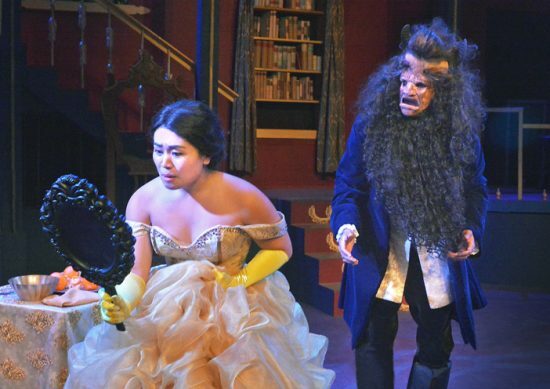 A small playhouse in Boyle Heights presents a culturally diverse “Beauty and the Beast,” while struggling to survive. Mark Saburo Kraus knows that local theater is about far more than simply staging plays. “Theater is magical. It creates community,” said Kraus, the head administrator of Casa 0101 Theater, a small company and venue in Boyle Heights. On one hand, the theater is enjoying success, as its production of Disney’s “Beauty and the Beast” has returned after a solidly popular run last year. On the other, the company is working feverishly to ensure this production is not its last. The show opened for previews last weekend, to be followed by a five-week run that begins this Friday, May 11, and runs through June 10. The Broadway musical is presented in association with L.A. City Councilmember Gil Cedillo and El Centro Del Pueblo, and features a diverse and multicultural cast of 28 actors on the main stage of Casa 0101, located on East First Street. “People are interested to see what America looks like. It’s exciting to think kids are growing seeing diversity and not even having to think about it,” he said during a chat at the Rafu offices last week. Sugimoto said in an age when many people have disappeared into the glow of their phones and mobile devices, the communal event of attending a play offers a shared experience that cannot be replicated online. “I want to think people are moving toward positive reinforcement, and Disney does it well,” he explained. “It’s two hours where you’re separated from your phone, and there’s a rainbow of people on stage loving true identities and loving who you are. The ensemble cast also features Youca Shimura, who has years of community theater experience, much of it in New York, under her acting belt. She said there are few experiences that offer the kind of intimacy that small venues afford. The story is Disney’s iteration of the classic French fairy tale, and follows Belle, a young woman in a provincial town, and the Beast, who is actually a handsome young prince who lives in a luxurious castle in France. The prince shuns a beggar pleading for shelter from the freezing cold due to her repulsive appearance (not realizing she is actually an enchantress) and is transformed into a hideous beast for his cold-hearted and selfish ways. The enchantress casts a magic spell upon the prince’s entire castle, including his good-natured servants, who are changed into household objects to reflect their different personalities. Ashamed of his new appearance, the Beast conceals himself inside his castle with a magic mirror as his only window to the outside world, and an enchanted rose, which will bloom until he turns 21 years of age. Time, however, is running out. If the Beast can learn to love a woman and earn her love in return before the final petal falls off the rose, the curse will be broken and he will return to his original self as a prince. If not, he will remain a beast forever, and all the members of his household will be doomed as well for all eternity. Disney’s version of the musical opened on Broadway on April 18, 1994, and was a smash hit for years to come. Kraus said part of the appeal of staging “Beauty and the Beast” in such a local venue is that it enables a wider audience to experience the popular play. “It’s big, Broadway-caliber play in an intimate setting, and it’s accessible to a local audience at an affordable price,” said Kraus, who grew up in Boyle Heights. Casa 0101 is hardly immune from the challenges any small theater arts venue faces, namely those with a dollar sign attached. Opened in a converted storefront in 2000, the company is now dealing with the very real possibility of being forced to shutter its operations, as rents and other expenses continue to rise. The theater has launched its Casa350 campaign, the primary goal of which is to earn the commitment of 350 donors, each providing $25 dollars per month to keep the doors open and the lights on. Kraus said the number of pledged donors has reached 187, more than halfway to the goal. To bolster the theater’s operations, founder Josefina Lopez has opened a small restaurant near the playhouse, to augment the night out for a show with dining. Kraus said it’s a refreshing option in a neighborhood where few dining spots are open late. Dinner at the Casa Fina Restaurant and Cantina, a few blocks away, can be added to the price of the show ticket. Sugimoto, who was a cast member of Casa 0101’s production of “Aladdin,” said what the theater does not only on stage, but for the community, is what drew him back for this show. “This group is super-dedicated, and I really loved what they were doing. I wanted to be immersed in that energy once again,” he said. Disney’s “Beauty and the Beast” runs May 11 through June 11. Showtimes are Fridays and Saturdays at 8 p.m., with matinees Saturdays at 2 p.m. and Sundays at 3 p.m. Dinner and theater packages are available at Casa Fina Restaurant and Cantina, 1842 E. First St. Premium dinners are an additional $25 to the ticket price; regular dinners an additional $15. Visit www.casa0101.org for more information and menu choices.